Breast cancer is the most common type of cancer diagnosed during pregnancy, affecting about 1 in every 3,000 women who are pregnant, according to the American Society of Clinical Oncology. While treatment largely depends on the type of breast cancer, there’s still much debate around whether chemo on a pregnant woman will have long-term effects on the baby. That’s the decision Ben and Sarah had to make: Start chemo right away and improve Sarah’s chances of survival, or wait until the baby was born so the baby's health couldn't be at risk. 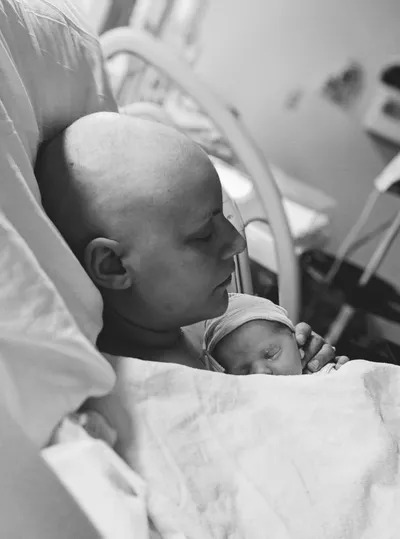 “Coming to terms with the hair loss that will happen, the inability to breastfeed after the baby is born (because of the chemo), and many other things was a struggle for her,” Ben wrote in a blog post a few days after Sarah started chemo. “Emotionally it was and will be a roller-coaster over the next 6 months or longer. But we keep seeing more of God's plan.” Faith has helped Ben and Sarah make room for a positive light through this dark experience. “So it's possibly a complicated future decision tree. Nobody really knows for sure,” Ben wrote in a blog post the day Noah was born.